Central idea: Loving life by hating it. Doctrine: The virtue of temperance or selfless self-preservation. Practical application: Personal encounter with Christ. To view Lectionary 35, click here. and the house of Judah. and I had to show myself their master, says the LORD. with the house of Israel after those days, says the LORD. how to know the LORD. for I will forgive their evildoing and remember their sin no more. “The New Testament presents the death and resurrection of Jesus of Nazareth as inaugurating a new covenant open to anyone who professes faith in Jesus the Christ” (NAB note). We have the ability now, through grace, to know God, to be his son or daughter, to find his law of love written in our hearts, and to be forgiven our sins. Because for each of us personally the new covenant is only beginning, we still need to be taught by our “friends and relatives how to know the Lord.” These friends and family are the members of the Church. This teaching is the work of evangelization and catechesis. This new covenant, unlike the Mosaic covenant, is gentle and without coercion. In Exodus, God led the Chosen People out of Egypt with powerful signs. When they disobeyed the covenant, God punished them like a master would chastise a disobedient slave. But the New Covenant is voluntary and fitting free persons. Our hearts are completely cleaned in Baptism, but as our lives go on, we sin and so sully them. God is always ready to ‘forgive our evildoing and remember our sin no more,’ as Jeremiah put it. We need clean hearts both because they are good for us to have and because goodness can draw others to God and to doing good. Our Lord always was perfect, both perfect God and perfect man. However, he had a work to accomplish, and this work was completed when he remained perfectly obedient to the Father by suffering everything his Passion called for. We can imitate Christ whenever we want, because we all have sufferings, large and small, that we can offer to the Father. We learn obedience to the Father, who permits us to experience these evils. We reverently offer them to the Father, who can save us from death. These crosses, so offered, perfect us. When Our Lord was lifted up from the earth he began to draw everyone to him. To be “lifted up from the earth” can mean Christ’s entire work to save and sanctify men: his sufferings, his being lifted up on the cross on which he died, his rising up from the dead, and his Ascension into heaven. Why draw everyone to him? Christ is “the source of eternal salvation,” as Hebrews puts it. When Our Lord was lifted up from the earth, God judged the world. Part of the judgment was against the ruler of this world, that is, the devil, and the judgment was to begin to drive him out of the world. The other part of the judgment pertained to us. This judgment was radically different than what we might expect from the judgment against the world in the story of Noah or the judgment against Sodom in the time of Lot. Instead, God’s judgment was that he loves us even in our sins and wants to save us. He wants to lift us from the dominion of the devil whose subjects we are if we sin. When Our Lord was lifted up from the earth, he glorified the Father and himself. He did this in the most surprising and counterintuitive way. He glorified himself by completely emptying himself, by letting himself be marred and humiliated and crushed. An earthly man would glorify himself by slaying all his enemies and forcing everyone else to serve him. The God-man glorified himself by serving everyone and by letting himself be slain. We participate in God’s good judgment toward sinners when we turn from loving our lives to hating them. What does it mean to hate your life? It means to turn from one’s understandable desire for self-preservation to reliance on God’s care. Hating your life means ordering all of those good things to the will of God. To live the virtue of Christian chastity, for example, means ordering one’s desire for sexual pleasure according to the will of God. This means saying no to what the desire wants in many circumstances and yes to it in others. That saying ‘no’ is the kind of good self-hatred Christ advocates. 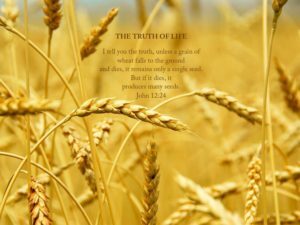 When we hate our lives—in this sense—we plant the grain of wheat in the ground so that it can begin to grow and bear fruit. When we do this “the Father will honor” us, because we are serving his son. Temperance is the virtue or good habit by which we moderate our desire for pleasurable things. We moderate this desire by saying yes to acts that give us pleasure only at the right time and in the right circumstances. Temperance moderates passions necessary for life: hunger and thirst because we must eat and drink; sexual desire so the human race can continue; anger to defend against aggression and injustice; and even hunger for knowledge so we can be educated. These passions are so good in themselves. Josef Pieper describes temperance as selfless self-preservation, whereas intemperance is selfish self-destruction (Pieper 150). Pieper argues that our passions get us in trouble because instead of the inner order that ought to prevail in us we have an actual interior disorder. God has created us with a nature which directs us to love him above ourselves, whereas due to original sin we are inclined to love ourselves more than God. We observe the inner order proper to us when we act in obedience to the moral law. Yet we often reject the moral order and make these life-giving drives destructive. One of the reasons the Church makes every Friday a day of penance and gives us the season of Lent each year is to help us put a curb on our passions, something possible through God’s grace and our cooperation. The virtue of temperance does not ask us to enjoy pleasures less; rather, it makes it possible to enjoy them as much as we wish but at the right time and under the right circumstances. We have seen that Our Lord asks us to hate ourselves in a good way. It is easy to see why many persons do not want to do this. It is easy to see why we Catholics do not want to do this! A lot of what Christ asks—which the Church merely echoes—seems very hard. Each of us can ask ourselves what are the obstacles that stand in the way of following Christ fully. The answer will be some form or combination of weakness, vice, sin, fear, or woundedness. The solution is Christ himself, the Divine Physician. He makes it possible for us to live according to his hard sayings. The authors are not saying this for people “out there” but are addressing each one of us, you and me. Each one of us needs to be renewed, as Pope Francis says. We should seek this everyday.